Quite often I find that QR codes are not used properly, not used at all where they should, or simply lack the needed oomph to really do the QR code justice and allow it to serve its purpose in the best way it can. But every once and a while, though even more so as of late, I stumble upon an advertisement or marketing item that really lets the QR code live up to its potential. The latest example I found was from Lacoste. 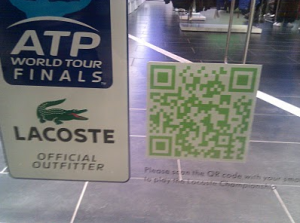 This advertisement and connected QR code was used in connection with the ATP Tennis World Tour which Lacoste was sponsoring at the time. So what Lacoste did was have a physical ad with a large, stand alone, QR code in their windows. Next to the code is a clear call to action to “scan the code with your smart phone to play the Lacoste Championship.” This “Lacoste Championship” was a tennis arcade game, really just a slightly modified version of ‘Pong’. After the consumer competed in the tennis match they were then given the option to register and receive a 15% coupon. 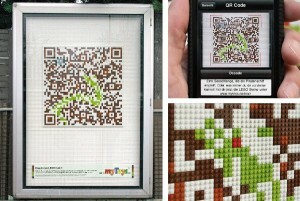 This is a great example of QR code use in a few ways. First, the physical advertisement made the QR code the center of attention; this makes sense since the QR code is where someone can actually take action. Second, there is a clear call to action. 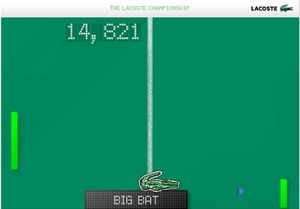 Third, the game creates a fun interactive experience with the brand and allows a positive connection with Lacoste. Fourth, the ultimate goal of the QR code campaign is to get the contact info of the consumer, so offering a 15% discount for registration easily entices the consumer to give permission to contact them at a future time. Fifth, of course the discount helps them move inventory off the shelves. This is a great example of how all companies should use QR codes, and when used correctly they can do a great job at driving sales, gathering consumer information, and providing great brand interaction. And all these benefits for only a minimal investment. Using QR Codes is a no-brainer; using them right is not, so make sure you adhere to the QR code best practices if you want to get the most bang for your buck. The Transport of London (TfL) got creative and intelligent with their recent addition to their advertising campaign. ; they added a QR code to all of their tube station posters. What this QR code does upon scanning is provide passengers with information pertaining to their particular tube stop. 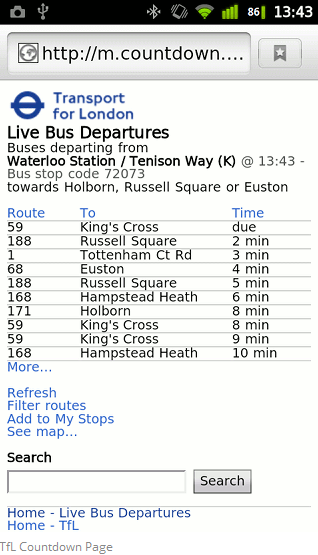 They can see where the current bus is departing from and most important, how much longer until the bus is due to arrive. It might also be important to point out, and give kudos to the TfL for adhering to the QR code best practices; a rarity by today’s marketers it seems. They ensured the landing page was a mobile optimized site, made sure the code was large enough and with a low density so that it was easy to scan, and made sure to have a call to action to entice people to scan the code. All important for a successful QR code campaign. In the end the campaign was a general success. 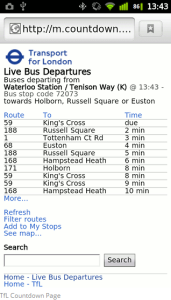 As of the end of 2012 the TfL QR code campaign was seeing an average scan count of 5,000 a month. Considering the size of the city that may not look like much, but how often do you take action when you see a poster with a website link or phone number? So the QR code it would seem is certainly helping draw people’s interest, at least in a greater way than a traditional advertisement. After seeing the success of the TfL there is no reason why all mass transit systems across the US, or the world, should not be using this inexpensive marketing tool to provide added value to customers. Even government run transit should be able to jump into the 21st century with this simple technology, the Transport of London was able to, so there is no excuse. Here is another QR code success story for you. MyToys.de is one of Germany’s largest internet toy stores, and Legos are one of their largest product lines they offer. So MyToys.de had a task for their advertising department: Advertise Lego, but do it in a creative way that will draw interest, but also make this marketing campaign bring people to the website to increase online Lego sales specifically. Well if I were in MyToys.de’s marketing or advertising department of course my initial thought would be to use QR codes, and that is most certainly what they did, but they did it is a far more creative way then most would have come up with (I guess that’s why they are in marketing and I am not). What MyToys.de did was build large 3’x3’, colorful 3D QR codes. These codes were then placed all around Germany for passerby’s to scan. Each code was different and had its own theme, containing some hard to recognize creative scene which could then be decoded upon scanning. The makeup of the codes drew people in and allowed MyToys.de to capitalized on their curiosity. Upon scanning of the code, the potential customer could decode the QR code’s scene and/or be directed to MyToys.de’s desktop website (of course they should have been directed to a mobile optimized site and not a desktop site, if only someone had read about QR code best practices before they ran this campaign). From the desktop landing page particular Lego boxes were advertised and could be ordered right from there. The results were great. 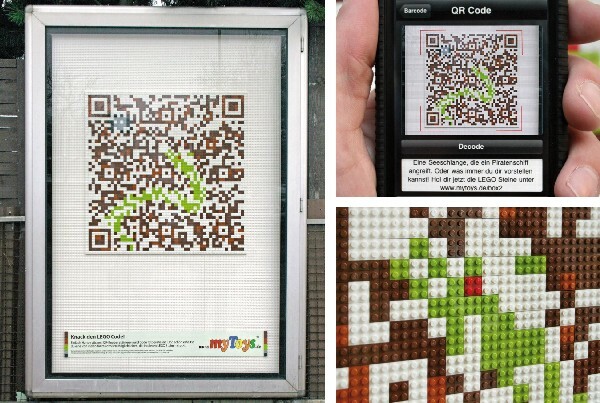 What this creative QR code campaign ended up doing was ensuring millions of Germans connected with and interacted with the Lego and MyToys.de brands in a fun way. Even more importantly the success of the QR codes were clearly visible by the fact that 49% of all traffic to the MyToys.de website were tracked from the QR code advertisements. This traffic helped drive sales for Lego, and in particular the Lego boxes advertised on the landing page people were directed to from the QR codes. In fact MyToys.de sold twice as many of these Lego boxes as opposed to the ones that were not advertised on the landing page. MyToys.de, with their Lego QR code campaign, is one of the rare companies using QR codes (for the most part) right, getting creative with their advertising, and using modern technology to connect with potential customers and drive sales. Any company that has traditional media and isn’t using QR codes to creatively connect with their brand or merchandise is losing ground and more than certainly losing sales. 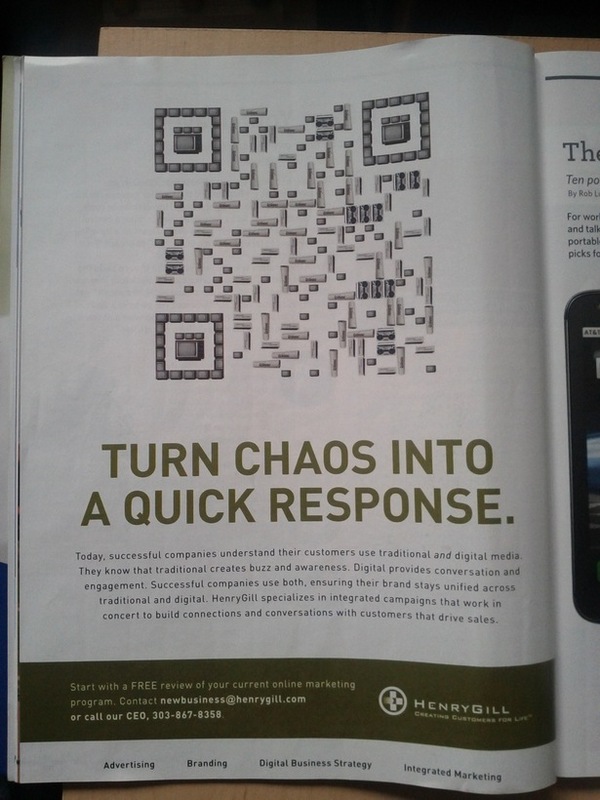 This is the first installment of an ongoing look at how NOT to use QR codes. As I stumble upon poor uses I will be sure to post a blog so we can all laugh at them and learn from them. If you look at the ad (Right), you might think “well that’s kind of a cool creative way to run a QR code ad,” and you wouldn’t necessarily be wrong. The good thing is that the code stands out, it is the focus of the entire ad, and it is done in a creative way. Two problems though. First, and of less importance, is that only people already familiar with QR codes are going to know this is a QR code and that they can scan it, so a clarification or particularly a call to action is necessary to get the full benefit of using a QR code. Second and most importantly, this advertisement is in an in-flight magazine. Pause and think about that for a second… I’ll wait… Doesn’t do you much good to have a QR code if your customer doesn’t have access to the internet, right? It is vitally important that when you are planning on using a QR code in your advertisement or marketing materials you think about where the person will be when they are likely to scan the code. 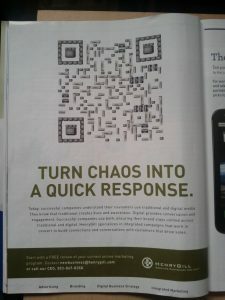 If you know the ad is going to be in an in-flight magazine you do not use a QR code, because unless a person takes the magazine with them, or is looking at the magazine in the few minutes before take-off, they won’t be able to scan the code. If your code is going to be in the subway, for another example, you will want to know if there is wi-fi or cellular reception there or not and so on for all marketing or advertising campaigns that plan on using QR codes. Towards the first mistake made in this ad, you must use a call-to-action. Most people are not going to scan a code (assuming they know that is what they are supposed to do) if they are unsure what the benefit is. So you must make sure there is a good reason to scan the QR code and make sure anyone reading the ad or marketing materials will be aware of this reason. Entice them to scan it, don’t just place it in a sea of white and expect someone to waste precious seconds of their life scanning your potentially useless code. People have celebrities to follow and can’t spend their whole life risking seconds of their time finding out if your QR code is worth their time to scan. For most information on QR code best practices go here and be sure to check out Part 2 of How NOT to Use QR Codes. And please, think before you code. 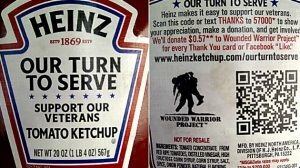 This past Veterans Day you may have noticed a change to Heinz Ketchup’s label. Besides the new red, white and blue colors, you would have noticed a QR code with the headline “Our Turn to Serve.” This “Our Turn to Serve” campaign was more than just a typical marketing campaign, it also helped raise awareness and money for the Wounded Warrior Project, a non-profit organization whose mission it is to honor and empower wounded veterans. This QR code and description of the campaign could be found on all Heinz bottles at restaurants across the country. Using the QR code allowed Heinz to connect with potential supporters at the very moment they were using their product. This ensured huge participation. Upon scanning the QR code on the back of the bottle you would be directed to a mobile optimized landing page. From here you had the choice of sending a personalized “Thank You” card to a wounded veteran, and/or you could choose to “Like” Heinz’s Facebook page. 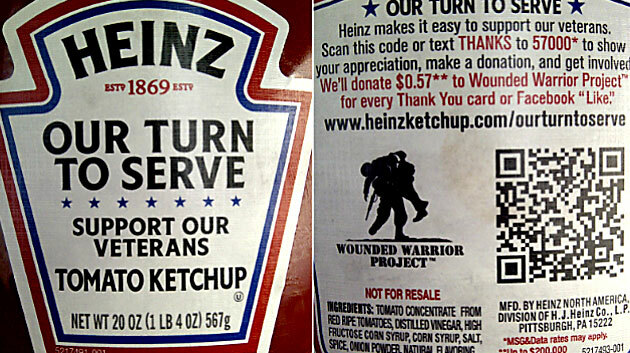 If you chose to “Like” their Facebook page, Heinz would then donate $.57 to The WWP. The results of the campaign were fantastic, both for Heinz Ketchup and the Wounded Warrior Project. The “Our Turn to Serve” campaign netted Heinz over 60 million media impressions, thousands of Facebook “Likes” and comments, all which in turn helped increase the Heinz brand. The campaign also helped wounded veterans as it ended up donating over $200,000 to the Wounded Warrior Project and sent over 75,000 “Thank You” cards to wounded Veterans. Heinz understood that a QR code could be a great way to connect with their customers and the ½ million QR code scans the campaign totaled is proof of that. More companies should start using this technology in similarly creative ways to help drive business, increase their brand and/or help push some charitable cause like Heinz has done here. If you aren’t using QR codes to connect your traditional media with your mobile media, you are certainly behind the times but more importantly, you are falling behind in promoting your brand and likely losing potential customers.